Hours of Operation: 8am-5pm PT every business day ; We look forward to hearing from you! # Specifics and Regulations: C-Gro recommends a soil application for maximizing production results. – Garden produce: use 2 gallons per acre C-Gro concentrate in soil with normal fertilization. Example: 100 ft X 4 ft = 400 ft ==> 400 divided by 43,560 = 0.00918 X 256 (2 gal) = 2.35 oz/seed row ==> Mix 1 part C-Gro to at least 4 parts water. – Medium size trees (size 3-6 feet): use 4 oz C-Gro per tree with normal fertilization not to exceed 6 gallons per acre. – Large trees (size 6-12 feet): use 6 oz C-Gro per tree with normal fertilization not to exceed 6 gallons per acre. – Potatoes: 3 gallons C-Gro per acre with normal fertilization. – Row & Specialty Crops (Hops, corn, grass seed, onions, alfalfa): 2 gallons C-Gro per acre. – Cereal Grains: 1 ¼ gallons C-Gro concentrate per acre in soil for irrigation application or 1 gallon C-Gro concentrate per acre in dryland application placed either in seed row (recommended) or soil applicator using normal fertilization. – House or Outdoor plants: ¼ Tsp C-Gro (8-10 drops) for small plants with normal fertilization. ½ tsp C-Gro (15 drops) per medium size plant using normal fertilization. – Calculations: 2 drops per sq ft or 0.1ml = 1 gallon of liquid per acre (591 drops = 1 oz). – Spray:Mix: 1 ¾ oz C-Gro per gallon of water for foliar application (misting the leaves of the plant) with normal fertilization. Repeat in 3 weeks. A minimum of 2 applications per season is recommended. # Product Handling Suggestions: C-Gro concentrate by itself will settle out a precipitate. Agitation is required if left standing for more than ½ hour. Settling time increases the more it is diluted with water. Avoid setting product in direct sunlight or next to electrical devices which reduces its effectiveness. C-Gro readily mixes with water and some liquid fertilizers (if fertilizer mixes are applied immediately). Delayed application may cause a settling out of nutrients. Application with herbicides is prohibited. Application with herbicides enhances the effectiveness of the chemical and will cause damage to crop plants. C-Gro, Inc has determined that a seed row application of the product at time of planting produces the optimum results for a high percentage of plant germinations and seedling vigor. Foliar application of C-Gro requires more than one application per season. Use 1.75 ounces per gallon of water. Mist leaves at three week intervals. In soil applications, a more even distribution of product occurs if 1 gallon of C-Gro concentrate is diluted in no less than 2 gallons of water. When applying C-Gro in a water application (circle irrigation), calibrate carefully the travel speed of the circle for an accurate application rate. 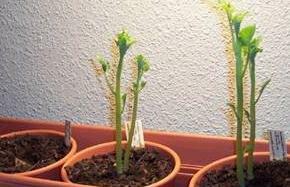 Apply early in the watering cycle as the plants will be more active in their uptake of C-Gro. The producers normal nitrogen fertilization rates are recommended in addition to the product application. If you need any further information please contact a company official. – Mansfield Wheat : 1 gal/acre C-Gro application on dryland wheat. – Mansfield Wheat Roots: C-Gro application improves root development. – Mansfield Wheat Heads & Seeds: C-Gro application improves number of heads and seeds per head. – Arizona Cantaloupe: Two weeks before harvest: C-Gro melon on right @ 2 gal/acre is more mature. 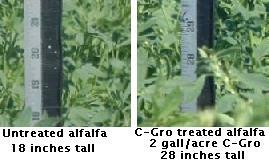 – Alfalfa: On 6-16-05: 16 days after C-Gro treatment alfalfa is 6 inches taller than untreated. – ALFALFA: 4-19-05: 28th day after 2nd cutting C-Gro alfalfa @ 2 gal/acre application rate. – C-Gro Dryland Winter Wheat: Large, long heads: test wt.1 lb more than untreated. – Peas, C-Gro Treated: Heavy foliage, many blossoms. – Field Corn Comparison: C-Gro corn on left @ 2 gal/acre is taller with broader leaves and better plant structure. – Field Bluegrass: C-Gro stimulates big production from an old stand in an area where burning is banned. – Granny Smith Apple Trees: C-Gro applied @ 4 gal/acre giving more foliage and branching. – Apple Star: C-Gro apple on left displays better developed star, full of seeds that improve apple quality and flavor. – Gala Apples: C-Gro applied @ 4 gal/acre results in heavy set of Gala apples on young tree. – Delicious Apples: C-Gro applied @ 4 gal/acre results in heavy set of delicious apples on young tree. – Apple Comparison: C-Gro delicious apples are uniform in shape, color and larger in size. – Older Apple Tree: Older apple tree in center was treated @ 6 gal/acre. Tree on left was untreated. – Apple Star Comparison: C-Gro apples @ 6 gal/acre have better stars and are more mature. – R & J Cherries: Rainier cherries injected @ 6 gal/acre. – Healed Cherry Tree: 6-22-05: diseased tree healed and producing after treatment of 4 gal/acre of C-Gro. – Young Pear Tree: C-Gro pear trees @ 4 gal/acre are healthier with more branching than control trees. – Cucumbers: C-Gro applied only at planting of seed. – Squash: C-Gro applied only at planting of seed. – Arizona Carrots: Young C-Gro carrots @ 2 gal/acre on left show better root development than more mature carrots on right. – R&J Rainier Cherries: C-Gro Rainier cherries @ 4 gal/acre: earlier maturing, deeper color and better flavor. – R&J Cherries Close-up: Harvested C-Gro cherries are more uniform in size with more weight per box. – Flemish Beauty Pear Comparison: C-Gro pears @ 6 gal/acre from an organic orchard. Pears on right with normal organic treatment only. – C-Gro Hedge Roses: Uniform colored blossoms; no pesticide needed for 2nd year in a row. – Pie Plate Roses: C-Gro roses @ 0.5 oz/plant: large blossoms extraordinarily fragrant. –C-Gro Bamboo Plant: 60 days after15 drops of C-Gro in water: full, firm, dark green leaf development. – C-Gro Lawn: Foreground: C-Gro @ 4 gal/acre. Background: untreated. – August 04 Zinnias: Zinnia seeds treated with 30 drops at planting result in large, green leaves and uniform blossoms. – Back Yard Roses: Injected with C-Gro @ 0.5 oz/plant. – C-GroTulip Inner Blossom: Large blossom: vibrant, beautiful inner pattern. – C-Gro Roses In Winter: C-Gro roses stay healthy through winter freeze and snow. – Lucious Blossoms: Once per season C-Gro treatment results in healthy growth. – C-Gro Iris Plants: 4-foot tall C-Gro iris with large blossoms for pennies a year. C-Gro provides a healthier production balance in the soil for plants. Current field testing results have proven just what Dr. Murray found in his experimentations for healthy plants and increased production. In conjunction with the normal fertilization programs in farming, the C-Gro product provides the necessary elements in the soil environment to enable the plant to reach its full genetic potential. Formulated from seawater through a patented process, C-Gro contains all the elements of the atomic table with the exception of several gases. More than 50 percent of these life-sustaining elements are absent from our soils, allowing environmental stresses to reduce the production potential of plants. C-Gro restores this balance. C-Gro crops mature earlier, are lower in disease and produce higher yields than untreated crops. Lab tests have provided evidence that plants (crops) grow without certain essential nutrients throughout their development. Subsequently, producers constantly try to play catch up for plant nutrient deficiencies by applying foliar additives during the plants growth cycle. C-Gro has over 80 elements in natural form; a buffet, of nutrients that when applied into the soil at the beginning of the season provide a healthy soil environment throughout the plant’s life. There is also evidence that systemic responses of plants may depend on electrochemical hydraulic controls operating at the cellular level. C-Gros patented process stimulates organic reproduction so systemic responses can flourish through liquid crystal memory. This process accelerates, into the plant, the missing nutrients required for healthy cell development during its entire growth cycle, from germination to fruit production. The C-Gro result is greater assimilation of energy from balanced nutrition, dramatically increasing production while strengthening the plants immune system to ward off predators. Todays soil scientists realize that the large commercial farmer, specializing in one or two crops using only a commercial chemical fertilizer program, is reducing the soils ability to keep the plant healthy, regenerate itself and produce acceptable yields. If this continues, soil will progressively lose its ability to sustain healthy and profitable crop production. In addition, we believe that C-Gro will substantially reduce the impact of new diseases that continue to plague the agriculture business. C-Gros focus is to make available our product to all plant growers and open the door for a provocative reversal in the decline of production, human health and nutritional life in the United States. Improving plant health, through this science and technology, C-Gro will promote Sea Energy for Agriculture. This product will reverse the lost nutritional value of soils and crops in the U.S. by improving both consumer health and the income of the farm business. All payments in US currency. PREPARED BY: Dr. Miles Athey, Director of Research, C-Gro, Inc.
80+ natural elements of standard seawater, less some gases and a reduction in sodium. Major minerals (Cl, Na, S, Mg, Ca, K, HCO3, Br, B, F, Sr, Si) =2.499% by weight. Trace minerals (other ~70 elements) = 0.001% by weight. Other substances (dissolved inorganic and organic materials, particulates, atmospheric gases) = 1% by weight. Therefore, solids/minerals =3.5% and water = 96.5% by weight. The seawater is concentrated through a patented process into a slurry of nutrients (typically 20 grams per liter). – Eyes: Wear protective goggles. Avoid contact with eyes. Flush eyes immediately with water. – Skin: Protect skin from contact. Causes slight irritation. Wash off skin with water. – Inhalation: If mist causes irritation or distress, remove to fresh air. – Ingestion: If swallowed, may cause short-term mild intestinal discomfort. – Respiratory Protection: No special requirements. No special procedures required. If spilled, flush area with fresh water to dilute concentration of product. Avoid storing in sunlight. UV rays reduce product effectiveness. Product retains effectiveness longer when stored at temperatures below 50°F. All information, recommendations and suggestions appearing herein concerning our products are based upon tests and data believed to be reliable. However, it is the user’s responsibility todetermine the safety, toxicity and suitability for his/her own use of the product described herein. Since the actual use by others is beyond our control, we make no guarantee, expressed or implied, as to the effects of such use, the results to be obtained, or the safety and toxicity of the product; nor do we assume any liability arising out of use, by others, of the product referred to herein. The information herein is not to be construed as absolutely complete since additional information may be necessary or desirable when particular or exceptional conditions or circumstances exist or because of applicable laws or government regulations. Center — Gen 2 — C-Gro  2 Gal. Right  Gen 2 — C-Gro  3 Gal. C-Gro treated potatoes weighed 90% more than those without C-Gro. Harvested at 73 days instead of 90 days as recommended. 2 1/2 weeks earlier to market. Brix Refractometer 30% higher in treated potatoes. C-Gro treated russet potatoes on the right compared to untreated russets on the left. These potatoes are about ten weeks away from scheduled harvest time but a couple of the treated potatoes are large enough to qualify for harvest already. The total weight of the treated potatoes is already nearly twice the weight of the untreated potatoes. Raspberries big as strawberries. Also notice the huge leaves. 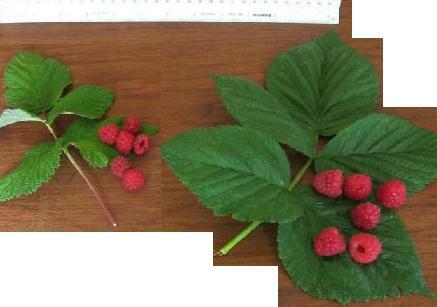 Leaves and raspberries from ordinary raspberry plant on left and C-Gro plant on right. The 6 berries from the treated plant weighed 20.66 gm and the 6 from the control weighed 8.53 gm. The picture is from an orchard farmer who randomly selected fruit from untreated and C-Gro treated trees with application of C-Gro in late October of 2004 at a rate of 4 gallons per acre through an irrigation drip system in his orchard. The above picture is a representation of a November 2004 application of C-Gro in an orchard in the Cashmere, WA area. The owner has used chicken manure that he incorporates in his orchard without adding any commercial fertilizer and had used this practice for the past six years. C-Gro was applied at 4 gpa through the watering system. Several of the treated pears were randomly selected from the bin and weighed on a pound scale. The average weight of the C-Gro treated pears exceeded one pound with the pear in this picture being the largest. C-Gro is creation’s balanced formula from ocean water that has all the natural elements known to man, except some of the gases. It develops healthy and energetic plants. # Is this product safe to use? C-Gro is a natural liquid that is as safe to use as water. # Can C-Gro be used for all plants? Yes, C-Gros formula is the same for all plants but application rates vary. Please follow recommended rates closely. # Will I damage my plants if I apply too much C-Gro? It would take an application error in excess of 25% to experience a detrimental affect to your plants. # Is C-Gro a fertilizer? No, C-Gro is not a fertilizer but does have a lot of the nutritive elements that are in many commercial fertilizers. C-Gro is a natural liquid soil amendment that works in all plant applications. # Do I need to apply C-Gro often? No, one application per year is all that is needed for annual plants. A few perennial plants may require two applications depending on the health of the plant and its family. # Does C-Gro stimulate the plant to produce more growth? No, C-Gro stimulates the soil environment so the plant will grow healthier and reach its genetic potential but not provide a jungle of growth. # Would C-Gro still improve yield if I use leading biological products? Yes! The microbes in the soil are reduced by tillage and pesticide applications. Biological products are useful and are applied to increase micro-organism populations that work to provide a healthier soil environment in which the plant can grow. But micro-organisms alone may not increase yields due to the lack of some minor elements the plant needs. Remember, C-Gro contains all the natural elements know to man with the exception of the gases. C-Gro acts as a catalytic trigger in the soil environment providing the balance of nutrients needed for the plant to be healthy and maximize its fruit or seed bearing potential. # You say C-Gro is all natural, then is it an organic product? Yes, C-Gro is a safe all natural liquid product and will soon make the allowed NOP products list for the fast growing organic farming industry. # Is C-Gro affordable and can I buy C-Gro in a variety of quantities? Yes, C-Gro is affordable. House plants cost just pennies to treat once a year. Farm crop application costs are much less than any pesticide or herbicide application cost to the farmer and C-Gro helps the crop withstand the stress of these applications. C-Gro, Inc markets the product in several sizes from small containers for the homeowner/gardener to bulk deliveries for the large corporate farms.